Continuation from the previous 106 parts, the whole series can be found at http://www.nikoport.com/columnstore/. I would like to thank Sunil Agarwal (Program Manager) & Vassilis Papadimos (Software Engineer) for all their patience and explanations, helping me to get to the bottom of the faced issues and delivering me a precise explanation. From a recent experience at a customer, I had an opportunity to dive into the details of the Columnstore Indexes Dictionaries. I have to admit that my understanding of them was pretty low, from what I have learned in the recent days, and I would like to share what I have learned with everyone. Let us step back into SQL Server 2012, where the dictionaries had different names, where global dictionaries were called primary dictionaries and the local dictionaries were called secondary dictionaries. This week I came to realisation that the change was not perfect after all, because in reality the local dictionaries are not exclusively to the Row Groups. This means that a given local dictionary can be used in more than 1 row group and for me, this means that the local dictionaries are not very local. :) Well, in practice they won’t be shared between some random Row Groups, but they will be shared between the Row Groups that are compressed at the same time by the very same thread. 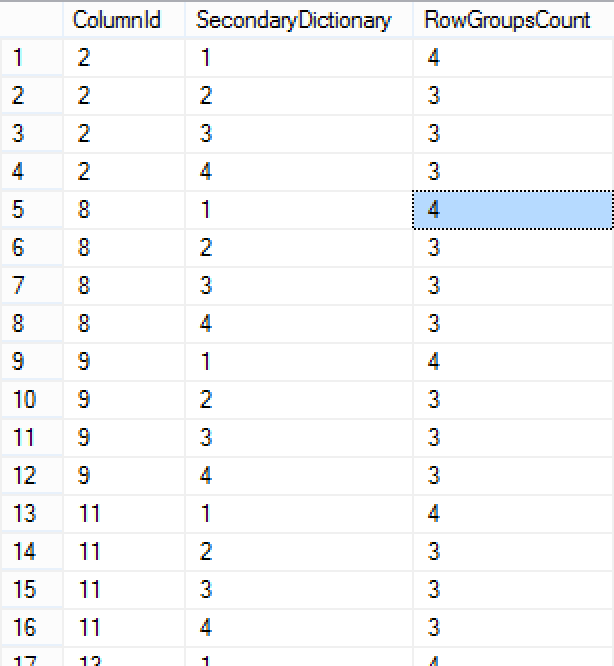 You can see that a big number of columns with dictionaries are actually being reused between different Row Groups, and what you should notice that the maximum value presented below is 4, which in reality corresponds to the number of CPU cores available and configured for SQL Server. This lead to wonder wether the maximum number of the CPU cores influences the number of the available will influence re-usage of the local dictionaries in the Row Groups and that lowering the total number of cores available for the process (by the means of applying the hint MAXDOP = 1) will increase the re-usage of the dictionaries. The results are very different this time, we do not have 38 rows returned, but just 16 in total, meaning that there are less dictionaries and that most probably grew bigger. At the same time, the frequency of their repetitive usage between different Row Groups sky-rocketed: with just 14 Row Groups (use the DMV sys.column_row_groups to verify that) we can easily see that some local dictionaries were re-used in every single one of them. This means that the single thread is capable to re-use those dictionaries for all the row groups that are within it’s reach and this is a very important information for those who are tuning their Columnstore Indexes. Focusing on the Delta-Stores, think about them as the good way of loading the data, that most of the time will not be trimmed because of the existing local dictionaries. The query above delivers no results in my case, meaning that no local dictionary was re-used for the new Row Groups, compressed by Tuple Mover. Do not think about this method as a silver bullet, because as I have shown in Columnstore Indexes – part 68 (“Data Loading, Delta-Stores & Vertipaq Compression Optimisation”), having secondary Nonclustered Rowstore Indexes over Clustered Columnstore Index and loading data with Tuple Mover will disable the Vertipaq optimisations, which will have a definitive impact over your overall size of the table. In the end, think about the current system in the following way: when a local dictionary gets full, it will trim all Row Groups that are applying it. Another very interesting aspect that I have observed recently was the effect of the applied overall compression on the Columnstore Indexes over the Row Group trimming. Yes, you read it right - the type of the compression (Columnstore Default vs Columnstore Archival) will bring you actually different sizes for your Row Groups, if you are facing dictionary pressure, and if you have some strings columns in your table with the size of 10 characters or superior, it is most probable that you do. Let us take a simple table with a lot of characters to be inserted (800 to be precise), and generate a sequence of the similar values, that will successfully trigger dictionary pressure if we create Clustered Columnstore index after loading the data - 1.05 Million Rows. This time with the Columnstore Archival compression we have received 52 Row Groups with the most of them containing around 1/3 of the rows, that a Row Group for the default Columnstore compression contains - around 20K. This is really a huge difference but what about the overall size ? 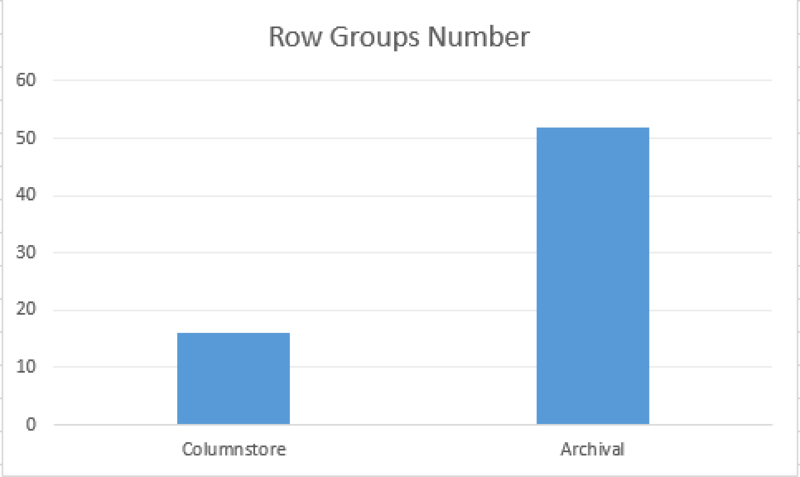 While definitively the number of Row Groups has increased and the overall size of the Row Group has decreased 3 times, the overall size of the table has decreased 3.5 times with the Columnstore Archival compression!!! We need to watch out, because with the small Row Groups will disable the advantages of the perfecting, that I have described in Columnstore Indexes – part 50 (“Columnstore IO”). 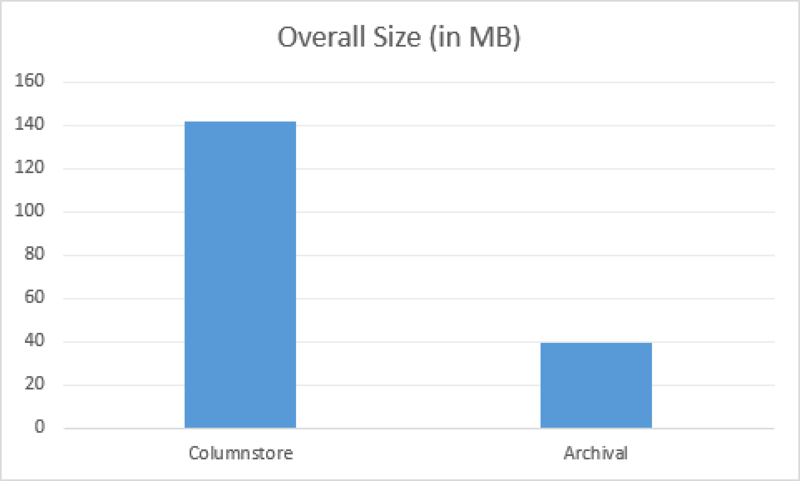 But let's dive a little bit into the actual dictionary sizes for both of the scenarios - for the default Columnstore and for the Columnstore Archival compression. The results for the both scenarios are quite impressive - while the maximum local dictionary for the default compression rounds about 7-8 MB (and this is where the real dictionary pressure starts in my experience), for the Columnstore Archival compression the size that we can see is that the biggest local dictionary is around 0.7 MB ! How can it be that while Microsoft says that the dictionary pressure arises for the 16 MB and we have here dictionary pressure for the dictionary that is not even 1MB big ? This has to do with the fact that the dictionaries themselves are compressed and depending on the overall compression of the Columnstore Index, the different compression will be applied on the dictionary itself. This is the reasons that for the years I have been observing the dictionary pressure starting to show around 7-8 MB, this was happening because I could only observe the compressed size of the dictionaries. This brings us to the stand that the dictionaries DMV should expose the uncompressed size of the dictionary, because this would allow us to determine when the pressure starts to arise in advance or at least to confirm the expected situation. Which column caused the Dictionary compression? 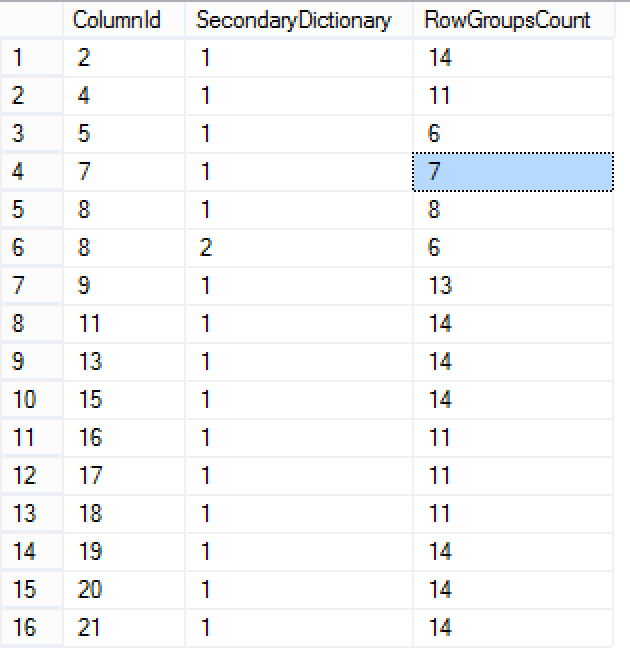 Another thing that is really missing from the engine is when we have a huge fact table with hundreds of columns and dozens of string columns, should we determine that our Row Groups are trimmed because of the dictionary pressure, how can we determine which exact column has caused the pressure to trim ? In order to start removing or re-engineering this column we need to determine it, and playing with all of them on the huge tables is not a real option. Right now there is no way to determine it, because no DMVs or Extended Events will deliver this information, but I will be opening a Connect item for Microsoft to include this information in the future (and hopefully at least SQL Server 2016) releases. It is fascinating to discover all different aspects and situation how Columnstore Indexes are functioning, we need to watch over our indexes in order to get the best efficiency out of them, because leaving them alone, might lead us to low and inefficient performance. What I would like to have in the future?